Do you have lots of images and want ultra fast and ultra small application to browse them with? I have created application HakView for exactly this purpose. You can open images one by one from desktop or open folder and browse all images using arrow keys to previous and next image. Now 166 image file types are supported. HakView can only access those folders that you have granted access to using Open File dialog (not using drag and drop). Since HakView version 1.0.8, the application will remember the access to the folder and store it securely locally on your Mac. With such configuration, next time you open an image in the same folder or subfolder, application will automatically read all other images in the folder without asking you to grant the access again. You can update or remove this access (secure bookmark) anytime from the preferences window. For best experience, grant access to “MacBook HD” folder (i.e. “/“) in preferences window. Then you can browse all your images freely. Open HakView and use File-Open menu to select folder with pictures. Then simply use left and right arrow keys to move to previous/next image in that folder. The "f" key will zoom small images to maximum window and back. The "enter" key (or CMD+F) will switch between fullscreen and window mode. The "c" key will center image (if you moved it away from center). The "l" key will open sidebar with list of images and the current image is highlighted. The "Delete" or "Backspace" keys will delete currently viewed image (after confirmation). 1. You can associate images with HakView and then simply double click on an image to display it. 2. You can right click on an image and select "open with" and select HakView. 3. 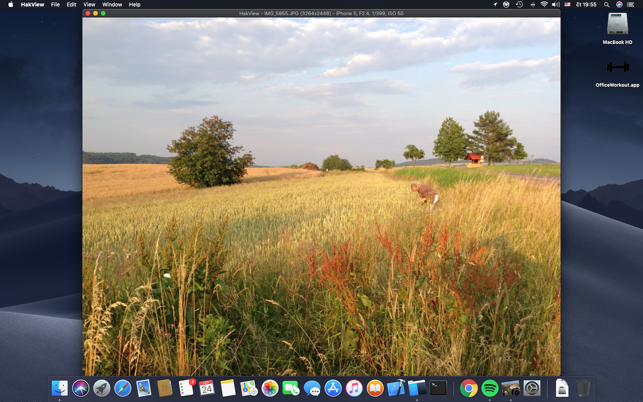 You can drag an image and drop it to HakView app icon. 1. Best way is to grant access to “MacBook HD” folder (i.e. “/“) in the preferences window. Then you can browse all your images. 2. If you already have an image open in HakView, you can view other images from the same folder by pressing CMD+O to open file dialog and then pressing enter. This will quickly open all pictures in the same folder. Then you can use arrow keys to browse through all images in the folder. 3. 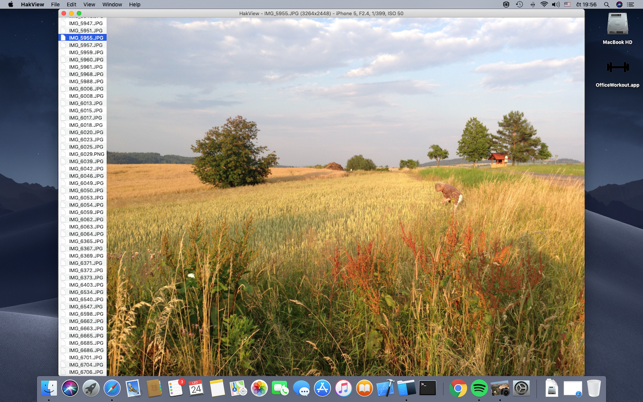 You can also open more images by simply dragging them and dropping to HakView application icon. I don't normally leave reviews, but thank you for this easy-to use application. I have a lot of photos and need a program to allow me to go through them quickly and smoothly. Your description perfectly says what the application does. Thanks for making it free and completely accessible.